McLaren scored a long-awaited 1-2 result in Brazil - the team's first in five years - but that was not the real story of the Brazilian Grand Prix because the achievement of race winner Juan Pablo Montoya and title contender Kimi Raikkonen was eclipsed by Fernando Alonso's World Championship. And the way in which Fernando and Kimi hailed one another after what was a rather dull race. This year may be remembered as the year in which Fernando Alonso won his first World Championship but in truth it belongs to both men. The score at the moment is six wins apiece and Raikkonen will be trying hard to end the year with more wins than the World Champion but Alonso has also made it clear that now the gloves are off and he is going to race actively rather than gathering up points in a disciplined fashion. The problem he has is that the McLaren is still the car to have. On this occasion Montoya used it best and made no mistakes and so victory was his but the feel good factor at Interlagos on Sunday night came from the two men who shared the podium. "Of course it is disappointing not to be fighting for the championship any more," said the Finn, "but we realised there were not that many races to go and we needed to have really good luck to win it, so it is not really so disappointing. Congratulations to Fernando he definitely deserved it." "It was fantastic for me and for him, the competition. I think thanks to Kimi this world title is much better for me because Michael Schumacher had some problems with the Ferrari this year and to beat the McLarens and especially Kimi this year was extremely difficult. As we saw in the last part of the championship, it's impossible to win one race when they have no problems so to beat Kimi this year is probably more than Michael in the last couple of years." The remarks were heartfelt and genuine and that was nice to see. 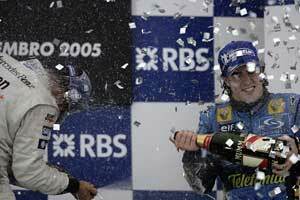 There was no show business in the 2005 World Championship. The nicest thing was the way in which Alonso put his own mark on the title. The 24-year-old Spaniard beat a record set 33 years ago by Brazil's Emerson Fittipaldi. It is a great achievement and the thing that stood out was that Fernando was utterly composed and, while obviously emotional, chose his words with the wisdom of a man many years his senior. He did it his way. There were no platitudes. "I came from a country with no traditions in Formula 1 and, you know, I fought alone, basically, because I had no help from anyone for all of my career. I arrived in Formula 1 thanks to the results in my previous categories and thanks to my sponsors and now I think this title is the maximum I can achieve in my life, in my career, and it is thanks to three or four people, no more than that. "I don't care about the people that don't like me. It's normal in sport; sometimes you support one driver, sometimes the other one. It's the same to me. I always try to do my job, try to always tell the truth to everyone and sometimes in Formula 1 this is quite hard because we don't tell the truth maybe 50% of the time but I do, and sometimes people don't like what I say." In the race, Alonso took the lead at the start but could not hold it, even if his Renault was a lot lighter than the McLarens. As things turned out the Renault had nine laps less fuel than Raikkonen and six less than Montoya. In the light of that Renault's great leap forward in qualifying did not seem quite as impressive as it did on Saturday night. But that was not the point. Alonso was still strong enough to stay ahead of the rest and that was all that mattered. Fisichella did not look strong at all and while one can blame some of that on the driver, the car must also take some of the blame. The fight between the two McLarens was decided early on because in the early laps Raikkonen was pinned in behind Alonso. It was lap 23 before he took second place and by then Montoya was seven seconds ahead up the road. Kimi closed that to 1.4secs by staying out three laps longer but Montoya remained ahead and with more fuel onboard in the second stint, Kimi dropped to almost five seconds behind. But he then stayed out five laps longer and so almost got out ahead of the Colombian. With Alonso third it really did not matter and, with McLaren keen to get a 1-2 after the recent near misses, the two men cruised for home. They ended the day 22secs ahead of Alonso but the gap would have been bigger if they had been pushing. The interesting thing was that Michael Schumacher was only 10secs behind and that was interesting because the Ferrari pace in qualifying had looked like a PR stunt. That turned out not to be the case as Michael was carrying more fuel than the two Renaults but less than the McLarens. He carried the same fuel as Jenson Button's BAR and Ralf Schumacher's Toyota and that meant that in qualifying Button did a stronger job but in the race The Tiger in Michael Schumacher re-emerged and bit those who dared to think that he might be easing off. In the first complex of corners Michael gave Christian Klien a lesson that he is not a man to be trifled with, forcing the Red Bull driver, with a lighter fuel load, to give way. After that he took advantage of the moment to scramble ahead of Fisichella and grab fourth place after Giancarlo had been jumped at the end of the back straight by Raikkonen. It all happened seconds before the Safety Car was deployed and the race neutralised. Fisichella got him back at the restart but Michael had more fuel and took back the place at the first pit stops. After that Fisichella attacked and Michael defended but the damage had been done. Backing up the evidence of a Ferrari improvement was Barrichello. He was a lot lighter than Michael in qualifying but dealt with Klien at the pit stops and then nailed Button's BAR on lap 44 and went on to finish sixth. Button was obviously struggling - it transpired that he had some tyre graining - but the Ferraris were obviously better than they have been of late. Having said that some of the opposition underperformed as well so it is difficult to tell. BAR had Sato running on a one-stop strategy because of his various penalties and Button struggled with tyres. Toyota had Trulli running with a heavy fuel load because of an engine change penalty in qualifying and he was also delayed badly in the melee at the start. Ralf Schumacher qualified only 10th and made no major progress apart from passing Klien during the second round of stops. The Red Bull team was down to one at the first corner when David Coulthard tried to drive into a gap that was not there and ended up taking out both the Williams-BMWs, which also hit one another in the mess that followed the initial contacts. DC later suggested that he could not make his car invisible but he might have eased off and avoided the shunt. Mark Webber, who can be forgiven for feeling unlucky, noted that the accident occurred "when David tried to pull out of the position he was in and clipped the back of Antonio". Mark later rejoined, 25 laps behind but he was unclassified at the end.